I goofed around in the kitchen and came up with these crunchy cashews, encrusted with what is essentially Laab dressing with the flavors of fresh lime and chilli as well as the fragrance of toasted rice powder. This is the kind of stuff that makes you cringe when you see other people do it: Tom Yam peanuts, Thai lime-lemongrass almonds, Thai lime-chilli macadamia nuts, etc. But when it’s you who do it? Delicious. I’m such a hypocrite. Oh my gosh I too cringe when I see tom yam peanuts or some version of that monstrosity at markets. I’m sure these homemade ones are delicious, though, and would certainly make a great party snack! What other nut would you recommend for this recipe? I am allergic to cashews but can eat all the rest and this looks great! 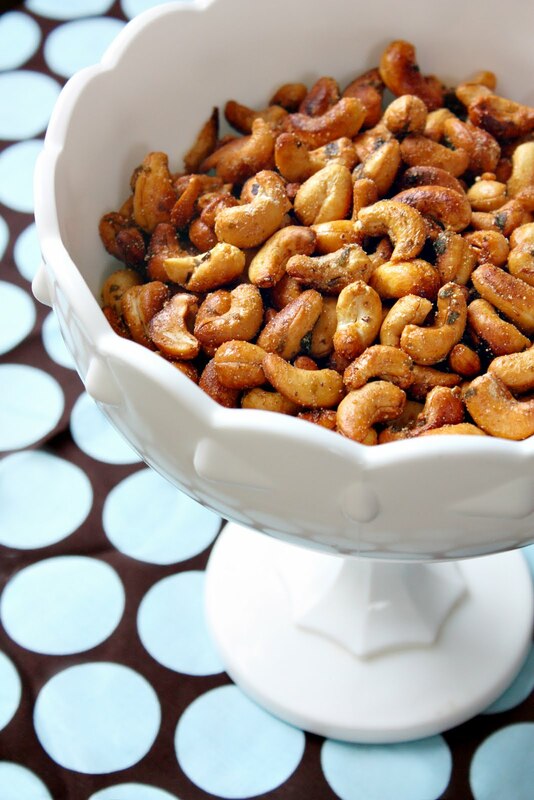 the baked cashews look nice, i think i’m going to try to make some for me..
I’m really torn, I have all the ingredients and it sounds simply amazing, but you see I made your original version of laab and we are seriously addicted. Now that we know our weak minds against the power of your recipes, it might not be such a wise thing to introduce tasty nibbles that can lead to mindless eating. Just found your blog – but I am def a new convert!